Drive 4,000,000 Miles (6,437,376 km) between now and 26th April, enough to circle the Earth 160 times! What will be the first reward? 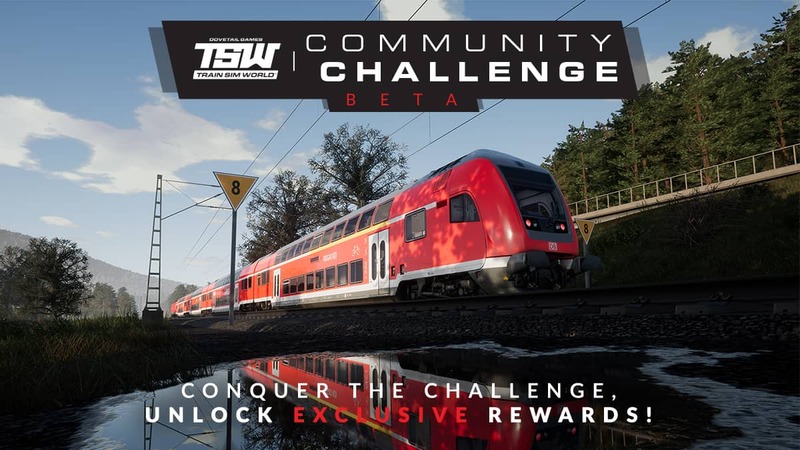 For our first community challenge, the reward will be an exclusive wallpaper pack, featuring 3 brand new pieces of Train Sim World artwork; the BR Class 166 from Great Western Express, the DB BR 143 from Ruhr-Sieg Nord, and the CSX GP38-2 from NEC New York. How can I download the rewards? If the target set by us is reached, the reward can be downloaded from the Dovetail Live website; there will be a "Challenges" tab on the Train Sim World hub, and on it you will be able to see all the rewards that have been unlocked. The rewards will be available to anyone with a Dovetail Live account, and will always be available to download. All you have to do is drive in Train Sim World on any platform, on any route, and in any locomotive, while signed into Dovetail Live, and your miles driven will be recorded and added to the community total. How can I see our progress? A Challenge Tracker can be seen below and on the top of the Train Sim World Hub that will regularly update as you and the rest of the community drive. You can also follow us on Facebook and Twitter for challenge updates.